In his February 28, 2012, testimony to the U.S. House of Representatives, Comptroller General Gene Dodaro provides an overview of GAO's 2011 Follow-up and 2012 Annual Report on opportunities to reduce duplication, overlap and fragmentation, achieve savings, and enhance revenue across the federal government. This is GAO's second annual report to Congress in response to the statutory requirement that GAO identify federal programs, agencies, offices, and initiatives, either within departments or governmentwide, which have duplicative goals or activities. For 81 additional opportunities to reduce potential duplication, save tax dollars, and enhance revenue, which we identified in March 2011, see GAO-11-318SP. This annual report for 2012 presents 51 areas where programs may be able to achieve greater efficiencies or become more effective in providing government services. This report describes 32 areas in which we found evidence of duplication, overlap, or fragmentation among federal government programs. We have found that agencies can often realize a range of benefits, such as improved customer service, decreased administrative burdens, and cost savings from addressing the issues we raise in this report. Cost savings related to reducing or eliminating duplication, overlap, and fragmentation can be difficult to estimate in some cases because the portion of agency budgets devoted to certain programs or activities is often not clear. In addition, the implementation costs that might be associated with consolidating programs, establishing collaboration mechanisms, or reducing activities, facilities, or personnel, among other variables, are difficult to estimate, or needed information on program performance or costs is not readily available. As the Actions Needed presented in this report show, addressing our varied findings will require careful deliberation and tailored, well-crafted solutions. This report also summarizes 19 additional opportunities for agencies or Congress to consider taking action that could either reduce the cost of government operations or enhance revenue collections for the Treasury. Collectively, this report shows that, if actions are taken to address the issues raised herein, as well as those from our 2011 report, the government could potentially save tens of billions of dollars annually, depending on the extent of actions taken. Fragmentation and overlap among government programs or activities can be harbingers of unnecessary duplication. Fragmentation refers to those circumstances in which more than one federal agency (or more than one organization within an agency) is involved in the same broad area of national interest. In some instances of fragmentation, we find overlapthat is, programs that have similar goals, devise similar strategies and activities to achieve those goals, or target similar users. Duplication occurs when two or more agencies or programs are engaged in the same activities or provide the same services to the same beneficiaries. In many cases, the existence of unnecessary duplication, overlap, or fragmentation can be difficult to estimate with precision due to a lack of data on programs and activities. Where information has not been available that would provide conclusive evidence of duplication, overlap, or fragmentation, we often refer to potential duplication, and where appropriate we suggest actions that agencies or Congress could take to either reduce that potential or to improve the accuracy and accessibility of information about program operations, performance, and results. In some instances of duplication, overlap, or fragmentation, it may be appropriate for multiple agencies or entities to be involved in the same programmatic or policy area due to the nature or magnitude of the federal effort. However, the areas discussed in the first section of this report identify instances where multiple government programs or activities have led to inefficiencies, and we determined that greater efficiencies or effectiveness might be achievable. Further, we have expanded the scope of our work this year to look for areas where a mix of federal approaches is used, such as tax expenditures, direct spending, and federal grant or loan programs. This is GAOs second annual report to Congress in response to the statutory requirement that GAO identify and report annually on federal programs, agencies, offices, and initiatives, either within departments or governmentwide, which have duplicative goals or activities. This body of work can help to inform government policymakers as they address the fiscal pressures facing our national government. The first report in this series, issued in March 2011, presented 81 opportunities to reduce potential government duplication, achieve cost savings, or enhance revenue. Like our March 2011 publication, this report identifies government duplication, overlap, and fragmentation as well as other cost savings and revenue enhancement opportunities. Its findings involve a wide range of government missions and touch virtually all major federal departments and agencies. This is GAOs second annual report to Congress in response to the statutory requirement that GAO identify and report annually on federal programs, agencies, offices, and initiatives, either within departments or governmentwide, which have duplicative goals or activities.1 This body of work can help to inform government policymakers as they address the fiscal pressures facing our national government. The first report in this series, issued in March 2011,2 presented 81 opportunities to reduce potential government duplication, achieve cost savings, or enhance revenue. This report for 2012 presents 51 areas where programs may be able to achieve greater efficiencies or become more effective in providing government services. Like our March 2011 publication, this report identifies government duplication, overlap, and fragmentation as well as other cost savings and revenue enhancement opportunities. Its findings involve a wide range of government missions and touch virtually all major federal departments and agencies. Federal agencies and Congress have taken or planned a number of actions that respond to issues we raised in our March 2011 report. Consistent with the commitment expressed in that report, we have continued to monitor developments in the 81 areas we identified. In a companion publication, Follow-up on 2011 Report: Status of Actions Taken to Reduce Duplication, Overlap, and Fragmentation, Save Tax Dollars, and Enhance Revenue,3 which we are releasing concurrently with this report, we describe the extent to which progress has been made to address the actions we identified a year ago. In summary, GAOs specific assessment of progress as of February 10, 2012, showed that 4 (or 5 percent) of the 81 areas GAO identified were addressed; 60 (or 74 percent) were partially addressed; and 17 (or 21 percent) were not addressed.4 In addition, the Office of Management and Budget (OMB) instructed agencies to consider areas of duplication or overlap identified by GAO and others in their fiscal year 2013 budget submissions and management plans. This report is divided into two sections. Section I presents 32 areas in which we found evidence of duplication, overlap, or fragmentation among federal government programs. Section II of this report summarizes 19 additional opportunities for agencies or Congress to consider taking action that could either reduce the cost of government operations or enhance revenue collections for the Treasury. To find areas where duplication might exist, GAOs work begins, in many cases, by identifying fragmentationthat is, those circumstances in which more than one federal agency (or more than one organization within an agency) is involved in the same broad area of national interest. In some instances of fragmentation, we find overlapthat is, programs that have similar goals, devise similar strategies and activities to achieve those goals, or target similar users. Duplication occurs when two or more agencies or programs are engaged in the same activities or provide the same services to the same beneficiaries. In many cases, the existence of unnecessary duplication, overlap, or fragmentation can be difficult to estimate with precision due to a lack of data on programs and activities. Where information has not been available that would provide conclusive evidence of duplication, overlap, or fragmentation, we often refer to potential duplication, and where appropriate we suggest actions that agencies or Congress could take to either reduce that potential or to improve the accuracy and accessibility of information about program operations, performance, and results. In some instances of duplication, overlap, or fragmentation, it may be appropriate for multiple agencies or entities to be involved in the same programmatic or policy area due to the nature or magnitude of the federal effort. However, the areas discussed in the first section of this report identify instances where multiple government programs or activities have led to inefficiencies, and we determined that greater efficiencies or effectiveness might be achievable. Further, we have expanded the scope of our work this year to look for areas where a mix of federal approaches is used, such as tax expenditures, direct spending, and federal grant or loan programs. Among the 32 areas where we found evidence of duplication, overlap, or fragmentation, this report describes a range of conditions. As the Actions Needed presented in this report show, addressing our varied findings will require careful deliberation and tailored, well-crafted solutions. We have found that agencies can often realize a range of benefits, such as improved customer service, decreased administrative burdens, and cost savings from addressing the issues we raise in this report. Cost savings related to reducing or eliminating duplication, overlap, and fragmentation can be difficult to estimate in some cases because the portion of agency budgets devoted to certain programs or activities is often not clear. In addition, the implementation costs that might be associated with consolidating programs, establishing collaboration mechanisms, or reducing activities, facilities, or personnel, among other variables, are difficult to estimate, or needed information on program performance or costs is not readily available. Section II of this report summarizes 19 additional opportunities for agencies or Congress to consider taking action that could either reduce the cost of government operations or enhance revenue collections for the Treasury. Collectively, this report shows that, if actions are taken to address the issues raised herein, as well as those from our 2011 report, the government could potentially save tens of billions of dollars annually, depending on the extent of actions taken. Many federal efforts, including those related to protecting food and agriculture, providing homeland security, and ensuring a well trained and educated workforce, transcend more than one agency, yet agencies face a range of challenges and barriers when they attempt to work collaboratively. Both Congress and the Executive Branch have recognized this, and in January 2011, the GPRA Modernization Act of 2010 (the Act) was enacted, updating the almost two-decades-old Government Performance and Results Act.5 The Act establishes a new framework aimed at taking a more crosscutting and integrated approach to focusing on results and improving government performance. Effective implementation of the Act could play an important role in clarifying desired outcomes, addressing program performance spanning multiple organizations, and facilitating future actions to reduce unnecessary duplication, overlap, and fragmentation. The Act requires OMB to coordinate with agencies to establish outcome-oriented goals covering a limited number of crosscutting policy areas as well as goals to improve management across the federal government, and to develop a governmentwide performance plan for making progress toward achieving those goals. The performance plan is to, among other things, identify the agencies and federal activitiesincluding spending programs, tax expenditures, and regulationsthat contribute to each goal, and establish performance indicators to measure overall progress toward these goals as well as the individual contribution of the underlying agencies and federal activities. The Presidents budget for fiscal year 2013 includes 14 such crosscutting goals. Aspects of several of these goalsincluding Science, Technology, Engineering, and Math (STEM) Education, Entrepreneurship and Small Businesses, Job Training, Cybersecurity, Information Technology Management, Procurement and Acquisition Management, and Real Property Managementare discussed in this report or in our March 2011 report. The Act also requires similar information at the agency level. Each agency is to identify the various federal organizations and activitiesboth within and external to the agencythat contribute to its goals, and describe how the agency is working with other agencies to achieve its goals as well as any relevant crosscutting goals. OMB officials stated that their approach to responding to this requirement will address fragmentation among federal programs. These requirements provide a much needed basis for more fully integrating a wide array of potentially duplicative, overlapping, or fragmented federal activities as well as a cohesive perspective on the long-term goals of the federal government focused on priority policy areas. It could also be a valuable tool for decision makers when reexamining existing programs and considering proposals for new programs. This annual report is based upon work conducted for completed GAO products and certain ongoing audits, which were conducted in accordance with generally accepted government auditing standards or with our Quality Assurance Framework as appropriate. For issues based on GAO work that has not yet been published or those that update prior GAO work, we provide additional information on the methodologies used in that ongoing work or update in the section of each issue area titled How GAO Conducted Its Work. For additional information on our approach to preparing the overall report, see appendix II of the PDF version of this report.6 Appendix III of the PDF version of this report includes lists of federal programs or other activities related to issues in this report, and their fiscal year 2010 obligations data, where such information was available.7 Where information is being reported on for the first time in this report, GAO sought comments from the agencies involved and incorporated those comments as appropriate. In most cases, agencies provided technical comments. Written comments are reproduced in appendix IV of the PDF version of this report. While the areas identified in our annual reports are not intended to represent the full universe of duplication, overlap, or fragmentation within the federal government, we will have conducted a systematic examination across the federal government to identify major instances of potential duplication, overlap, and fragmentation governmentwide by the time we issue our third annual report in fiscal year 2013.8 This examination involves a multiphased approach. First, to identify potential areas of overlap, we examined the major budget functions and subfunctions of the federal government as identified by OMB. This was particularly helpful in identifying issue areas involving multiple government agencies. Second, GAO subject matter experts examined key missions and functions of federal agenciesor organizations within large agenciesusing key agency documents, such as strategic plans, agency organizational charts, and mission and function documents. This further enabled us to identify areas where multiple agencies have similar goals, or where multiple organizations within federal agencies are involved in similar activities. Next, we canvassed a wide range of published sourcessuch as congressional hearings and reports by the Congressional Budget Office, OMB, various government audit agencies, and private think tanksthat addressed potential issues of duplication, overlap, and fragmentation. Lastly, we have work under way or planned in the coming year to evaluate major instances of duplication, overlap, or fragmentation that we have not yet covered in our first two annual reports. This report was prepared under the coordination of Janet St. Laurent, Managing Director, Defense Capabilities and Management, who may be reached at (202) 512-4300, or stlaurentj@gao.gov; and Zina Merritt, Director, Defense Capabilities and Management, who may be reached at (202) 512-4300 or merrittz@gao.gov. Specific questions about individual issues may be directed to the area contact listed at the end of each summary. Agriculture 1. Protection of Food and Agriculture Centrally coordinated oversight is needed to ensure nine federal agencies effectively and efficiently implement the nation’s fragmented policy to defend the food and agriculture systems against potential terrorist attacks and major disasters. Defense 2. Electronic Warfare Identifying opportunities to consolidate Department of Defense airborne electronic attack programs could reduce overlap in the department’s multiple efforts to develop new capabilities and improve the department’s return on its multibillion-dollar acquisition investments. Defense 3. Unmanned Aircraft Systems Ineffective acquisition practices and collaboration efforts in the Department of Defense unmanned aircraft systems portfolio creates overlap and the potential for duplication among a number of current programs and systems. Defense 4. Counter-Improvised Explosive Device Efforts The Department of Defense continues to risk duplication in its multibillion-dollar counter Improvised Explosive Device efforts because it does not have a comprehensive database of its projects and initiatives. Defense 5. Defense Language and Culture Training The Department of Defense needs a more integrated approach to reduce fragmentation in training approaches and overlap in the content of training products acquired by the military services and other organizations. Defense 6. Stabilization, Reconstruction, and Humanitarian Assistance Efforts Improving the Department of Defense’s evaluations of stabilization, reconstruction, and humanitarian assistance efforts, and addressing coordination challenges with the Department of State and the U.S. Agency for International Development, could reduce overlapping efforts and result in the more efficient use of taxpayer dollars. Economic Development 7. Support for Entrepreneurs Overlap and fragmentation among the economic development programs that support entrepreneurial efforts require the Office of Management and Budget and other agencies to better evaluate the programs and explore opportunities for program restructuring, which may include consolidation, within and across agencies. Economic Development 8. Surface Freight Transportation Fragmented federal programs and funding structures are not maximizing the efficient movement of freight. Energy 9. Department of Energy Contractor Support Costs The Department of Energy should assess whether further opportunities could be taken to streamline support functions, estimated to cost over $5 billion, at its contractor-managed laboratory and nuclear production and testing sites, in light of contractors’ historically fragmented approach to providing these functions. Energy 10. Nuclear Nonproliferation Comprehensive review needed to address strategic planning limitations and potential fragmentation and overlap concerns among programs combating nuclear smuggling overseas. General Government 11. Personnel Background Investigations The Office of Management and Budget should take action to prevent agencies from making potentially duplicative investments in electronic case management and adjudication systems. General Government 12. Cybersecurity Human Capital Governmentwide initiatives to enhance cybersecurity workforce in the federal government need better structure, planning, guidance, and coordination to reduce duplication. General Government 13. Spectrum Management Enhanced coordination of federal agencies' efforts to manage radio frequency spectrum and an examination of incentive mechanisms to foster more efficient spectrum use may aid regulators' attempts to jointly respond to competing demands for spectrum while identifying valuable spectrum that could be auctioned for commercial use, thereby generating revenues for the U.S. Treasury. Health 14. Health Research Funding The National Institutes of Health, Department of Defense, and Department of Veterans Affairs can improve sharing of information to help avoid the potential for unnecessary duplication. Health 15. Military and Veterans Health Care The Departments of Defense and Veterans Affairs need to improve integration across care coordination and case management programs to reduce duplication and better assist servicemembers, veterans, and their families. Homeland Security/Law Enforcement 16. Department of Justice Grants The Department of Justice could improve how it targets nearly $3.9 billion to reduce the risk of potential, unnecessary duplication across the more than 11,000 grant awards it makes annually. Homeland Security/Law Enforcement 17. Homeland Security Grants The Department of Homeland Security needs better project information and coordination among four overlapping grant programs. Homeland Security/Law Enforcement 18. Federal Facility Risk Assessments Agencies are making duplicate payments for facility risk assessments by completing their own assessments, while also paying the Department of Homeland Security for assessments that the department is not performing. Information Technology 19. Information Technology Investment Management The Office of Management and Budget, and the Departments of Defense and Energy need to address potentially duplicative information technology investments to avoid investing in unnecessary systems. International Affairs 20. Overseas Administrative Services U.S. government agencies could lower the administrative cost of their operations overseas by increasing participation in the International Cooperative Administrative Support Services system and by reducing reliance on American officials overseas to provide these services. International Affairs 21. Training to Identify Fraudulent Travel Documents Establishing a formal coordination mechanism could help reduce duplicative activities among seven different entities that are involved in training foreign officials to identify fraudulent travel documents. Science and the Environment 22. Coordination of Space System Organizations Fragmented leadership has led to program challenges and potential duplication in developing multibillion-dollar space systems. Science and the Environment 23. Space Launch Contract Costs Increased collaboration between the Department of Defense and National Aeronautics and Space Administration could reduce launch contracting duplication. Science and the Environment 24. Diesel Emissions Fourteen grant and loan programs at the Department of Energy, Department of Transportation, and the Environmental Protection Agency and three tax expenditures fund activities that have the effect of reducing mobile source diesel emissions; enhanced collaboration and performance measurement could improve these fragmented and overlapping programs. Science and the Environment 25. Environmental Laboratories The Environmental Protection Agency needs to revise its overall approach to managing its 37 laboratories to address potential overlap and fragmentation and more fully leverage its limited resources. Science and the Environment 26. Green Building To evaluate the potential for overlap or fragmentation among federal green building initiatives, the Department of Housing and Urban Development, the Department of Energy, and the Environmental Protection Agency should lead other federal agencies in collaborating on assessing their investments in more than 90 initiatives to foster green building in the nonfederal sector. Social Services 27. Social Security Benefit Coordination Benefit offsets for related programs help reduce the potential for overlapping payments but pose administrative challenges. Social Services 28. Housing Assistance Examining the benefits and costs of housing programs and tax expenditures that address the same or similar populations or areas, and potentially consolidating them, could help mitigate overlap and fragmentation and decrease costs. Training, Employment, and Education 29. Early Learning and Child Care The Departments of Education and Health and Human Services should extend their coordination efforts to other federal agencies with early learning and child care programs to mitigate the effects of program fragmentation, simplify children’s access to these services, collect the data necessary to coordinate operation of these programs, and identify and minimize any unwarranted overlap and potential duplication. Training, Employment, and Education 30. Employment for People with Disabilities Better coordination among 50 programs in nine federal agencies that support employment for people with disabilities could help mitigate program fragmentation and overlap, and reduce the potential for duplication or other inefficiencies. Training, Employment, and Education 31. Science, Technology, Engineering, and Mathematics Education Strategic planning is needed to better manage overlapping programs across multiple agencies. Training, Employment, and Education 32. Financial Literacy Overlap among financial literacy activities makes coordination and clarification of roles and responsibilities essential, and suggests potential benefits of consolidation. Defense 33. Air Force Food Service The Air Force has opportunities to achieve millions of dollars in cost savings annually by reviewing and renegotiating food service contracts, where appropriate, to better align with the needs of installations. Defense 34. Defense Headquarters The Department of Defense should review and identify further opportunities for consolidating or reducing the size of headquarters organizations. Defense 35. Defense Real Property Ensuring the receipt of fair market value for leasing underused real property and monitoring administrative costs could help the military services' enhanced use lease programs realize intended financial benefits. Defense 36. Military Health Care Costs To help achieve significant projected cost savings and other performance goals, DOD needs to complete, implement, and monitor detailed plans for each of its approved health care initiatives. Defense 37. Overseas Defense Posture The Department of Defense could reduce costs of its Pacific region presence by developing comprehensive cost information and re-examining alternatives to planned initiatives. Defense 38. Navy's Information Technology Enterprise Network Better informed decisions are needed to ensure a more cost-effective acquisition approach for the Navy’s Next Generation Enterprise Network. Economic Development 39. Auto Recovery Office Unless the Secretary of Labor can demonstrate how the Auto Recovery Office has uniquely assisted auto communities, Congress may wish to consider prohibiting the Department of Labor from spending any of its appropriations on the Auto Recovery Office and instead require that the department direct the funds to other federal programs that provide funding directly to affected communities. Energy 40. Excess Uranium Inventories Marketing the Department of Energy’s excess uranium could provide billions in revenue for the government. General Government 41. General Services Administration Schedules Contracts Fee Rates Re-evaluating fee rates on the General Services Administration's Multiple Award Schedules contracts could result in significant cost savings governmentwide. General Government 42. U.S. Currency Legislation replacing the $1 note with a $1 coin would provide a significant financial benefit to the government over time. General Government 43. Federal User Fees Regularly reviewing federal user fees and charges can help the Congress and federal agencies identify opportunities to address inconsistent federal funding approaches and enhance user financing, thereby reducing reliance on general fund appropriations. General Government 44. Internal Revenue Service Enforcement Efforts Enhancing the Internal Revenue Service's enforcement and service capabilities can help reduce the gap between taxes owed and paid by collecting billions in tax revenue and facilitating voluntary compliance. Health 45. Medicare Advantage Payments The Centers for Medicare & Medicaid Services could achieve billions of dollars in additional savings by better adjusting for differences between Medicare Advantage plans and traditional Medicare providers in the reporting of beneficiary diagnoses. Health 46. Medicare and Medicaid Fraud Detection Systems The Centers for Medicare & Medicaid Services needs to ensure widespread use of technology to help detect and recover billions of dollars of improper payments of claims and better position itself to determine and measure financial and other benefits of its systems. Homeland Security/Law Enforcement 47. Border Security Delaying proposed investments for future acquisitions of border surveillance technology until the Department of Homeland Security better defines and measures benefits and estimates life-cycle costs could help ensure the most effective use of future program funding. Homeland Security/Law Enforcement 48. Passenger Aviation Security Fees Options for adjusting the passenger aviation security fee could further offset billions of dollars in civil aviation security costs. Homeland Security/Law Enforcement 49. Immigration Inspection Fee The air passenger immigration inspection user fee should be reviewed and adjusted to fully recover the cost of the air passenger immigration inspection activities conducted by the Department of Homeland Security’s U.S. Immigration and Customs Enforcement and U.S. Customs and Border Protection rather than using general fund appropriations. International Affairs 50. Iraq Security Funding When considering new funding requests to train and equip Iraqi security forces, Congress should consider the government of Iraq’s financial resources, which afford it the ability to contribute more toward the cost of Iraq’s security. Social Services 51. Domestic Disaster Assistance The Federal Emergency Management Agency could reduce the costs to the federal government related to major disasters declared by the President by updating the principal indicator on which disaster funding decisions are based and better measuring a state’s capacity to respond without federal assistance. This section presents 32 areas in which we found evidence of duplication, overlap, or fragmentation among federal government programs. This section summarizes 19 additional opportunities for agencies or Congress to consider taking action that could either reduce the cost of government operations or enhance revenue collections for the Treasury. Section 21 of Public Law 111-139, enacted in February 2010, requires GAO to conduct routine investigations to identify federal programs, agencies, offices, and initiatives with duplicative goals and activities within departments and governmentwide. This provision also requires GAO to report annually to Congress on its findings, including the cost of such duplication, and recommendations for consolidation and elimination to reduce duplication and specific rescissions (legislation canceling previously enacted budget authority) that Congress may wish to consider.9 As agreed with the key congressional committees, our objectives in this report are to (1) identify what potentially significant areas of duplication, overlap, and fragmentation as well as opportunities for cost savings and enhanced revenues exist across the federal government; and (2) identify what options, if any, exist to minimize duplication, overlap, and fragmentation in these areas and take advantage of opportunities for cost savings and enhanced revenues. For the purposes of our analysis, we considered duplication to occur when two or more agencies or programs are engaged in the same activities or provide the same services to the same beneficiaries. We used the term overlap when multiple agencies or programs have similar goals, engage in similar activities or strategies to achieve them, or target similar beneficiaries. We used the term fragmentation to refer to those circumstances in which more than one federal agency (or more than one organization within an agency) is involved in the same broad area of national need and there may be opportunities to improve how the government delivers these services.10 This report presents 32 areas of duplication, overlap, or fragmentation where greater efficiencies or effectiveness in providing government services may be achievable. In light of the long-term fiscal imbalances that the federal government faces, and consistent with our approach for the first annual report, we also highlighted other opportunities for potential cost saving or revenue enhancements. To identify potentially significant areas of duplication, overlap, and fragmentation as well as opportunities for cost savings and enhanced revenues, for this and future reports we used a multiphased approach. Examination of budget functions and subfunctions of the federal government: We examined the OMBs MAX Information System11 fiscal year 2010 data to identify and analyze which federal agencies obligated funds for budget functions and subfunctions. Budget functions provide a system of classifying budget resources so that budget authority, outlays, receipts, and tax expenditures can be related to the national needs being addressed. Each budget account is generally placed in the single budget function (for example, national defense or health) that best reflects its major purpose, an important national need. A budget function may be divided into two or more subfunctions, depending on the complexity of the national need addressed. Because federal budget functions classify budget resources by important national need, identifying instances when multiple federal agencies obligate funds within a budget function or subfunction may indicate potential duplication or cost savings opportunities. Examination of key agency documents: When multiple federal agencies have similar missions, goals or programs, the potential for unnecessary duplication, overlap or fragmentation exists. As a result, we examined key agency documents such as strategic plans, performance and accountability reports, and budget justifications to determine and analyze their missions, goals, or programs. Review of key external published sources: We reviewed key external published sources of information. For example, we reviewed reports published by the Congressional Budget Office, Inspectors General, the Congressional Research Service, as well as the Presidents Budget to identify potential overlap and duplication among agency missions, goals, and programs. Because it is impractical to examine all instances of potential duplication or opportunities for cost savings across the federal government, we considered a variety of factors to determine whether such potential instances or opportunities were significant enough to require additional examination. Such factors included, but were not limited to, the extent of potential cost savings, opportunities for enhanced program efficiency or effectiveness, the degree to which multiple programs may be duplicative, overlapping or fragmented, whether issues had been identified by GAO or external sources, and the level of coordination among agency programs. On the basis of this multiphased approach we identified areas of potential duplication, overlap and fragmentation and opportunities for costs savings or revenue enhancement. GAO programmed work to examine these areas for reporting in this or future annual reports. Each issue area contained in Sections I and II of this report lists any respective GAO reports and publications upon which it is based. Those prior reports contain more detailed information on our supporting work and methodologies. For issues based on GAO work that has not yet been published or those that update prior GAO work, we provide additional information on the methodologies used in that ongoing work or update in the section entitled How GAO Conducted Its Work of each issue area. To identify the potential financial and other benefits that might result from actions addressing duplication, overlap, or fragmentation, we collected and analyzed data on costs and potential savings to the extent it was available. Estimating the benefits that could result from eliminating unnecessary duplication, overlap, or fragmentation was not possible in some cases because information about the extent of unnecessary duplication among certain programs was not available. Further, the financial benefits that can be achieved from eliminating duplication, overlap, or fragmentation were not always quantifiable in advance of congressional and executive branch decision making, and needed information was not readily available on, among other things, program performance, the level of funding devoted to overlapping programs, or the implementation costs and time frames that might be associated with program consolidations or terminations. We also included tables in appendix III that provide a detailed listing of federally-funded program names and associated budgetary information. While there is no standard definition for what constitutes a program, they may include grants, tax expenditures, centers, loans, funds, and other types of assistance. A wide variety of budgetary information may be used to convey the federal commitment to these programs. When available, we collected obligation information for fiscal year 2010 for consistent reporting across issue areas. In some instances, obligation data were not available, but we were able to report other budgetary information, such as appropriations. In other issue areas, we did not report any budgetary information, because such information was either not available or sufficiently reliable. For example, some agencies could not isolate budgetary information for some programs, because the data were aggregated at higher levels. We assessed the reliability of any computer-processed data that materially affected our findings, including cost savings and revenue enhancement estimates. The steps that GAO takes to assess the reliability of data vary but are chosen to accomplish the auditing requirement that the data be sufficiently reliable given the purposes it is used for in our products. GAO analysts review published documentation about the data system and Inspector General or other reviews of the data. GAO may interview agency or outside officials to better understand system controls and to assure ourselves that we understand how the data are produced and any limitations associated with the data. GAO may also electronically test the data to see if values in the data conform to agency testimony and documentation regarding valid values, or compare data to source documents. In addition to these steps, GAO often compares data with other sources as a way to corroborate our findings. Per GAO policy, when data do not materially affect findings and are presented for background purposes only, we may not have assessed the reliability depending upon the context in which the data are presented. For issues where information is being reported on for the first time in this report, we sought comments from the agencies involved, and incorporated those comments as appropriate. This appendix includes only those letters that agencies provided on official letterhead. In the letter below are comments on Area 7: Support for Entrepreneurs. In the letter below are comments on Area 14: Health Research Funding. In the letter below are comments on Area 23: Space Launch Contract Costs. In the letter below are comments on Area 29: Early Learning and Child Care. In the letter below are comments on Area 30: Employment for People with Disabilities. In the letter below are comments on Area 31: Science, Technology, Engineering, and Mathematics Education. In the letter below are comments on Area 32: Financial Literacy. In the letter below are comments on Area 39: Auto Recovery Office. In the letter below are comments on Area 42: U.S. Currency. 2) GAO, Opportunities to Reduce Potential Duplication in Government Programs, Save Tax Dollars, and Enhance Revenue, GAO-11-318SP(Washington, D.C.: Mar. 1, 2011). 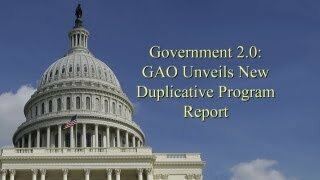 3) GAO, Follow-up on 2011 Report: Status of Actions Taken to Reduce Duplication, Overlap, and Fragmentation, Save Tax Dollars, and Enhance Revenue, GAO-12-453SP(Washington, D.C.: Feb. 28, 2012). 4) An issue area was considered addressed if all actions needed in that area have been addressed; partially addressed if at least one action needed in that area showed some progress toward implementation, but not all actions are addressed; and not addressed if none of the actions needed in that area were addressed. 5) Pub. L. No. 111-352, 124 Stat. 3866 (2011); Pub. L. No. 103-62, 107 Stat. 285 (1993). 6) GAO, 2012 Annual Report: Opportunities to Reduce Duplication, Overlap and Fragmentation, Achieve Savings, and Enhance Revenue, GAO-12-342SP(Washington, D.C.: Feb. 28, 2012). 7) For some issue areas, agencies were not able to readily provide programmatic information. Similarly, in some cases, we did not report budgetary information because such information was either not available or not sufficiently reliable. 8) The statutory requirement calling for this report also asked GAO to identify specific areas where Congress may wish to cancel budget authority it has previously provideda process known as rescission. To date, GAOs work has not identified a basis for proposing specific funding rescissions. 9) To date, this work has not identified a basis for proposing specific funding rescissions. 10) We recognize that there could be instances where some degree of program duplication, overlap, or fragmentation may be warranted due to the nature or magnitude of the federal effort. 11) The MAX Information System is used to support the federal budget process. The system has the capability to collect, validate, analyze, model, and publish information relating to governmentwide management and budgeting activities and can also be used as an information sharing and communication portal between government organizations. 12) GAO, Results-Oriented Government: Practices That Can Help Enhance and Sustain Collaboration among Federal Agencies, GAO-06-15(Washington, D.C.: Oct. 21, 2005). 13) GAO, Streamlining Government: Key Practices from Select Efficiency Initiatives Should Be Shared Governmentwide, GAO-11-908(Washington, D.C.: Sept. 30, 2011). 14) GAO, Federal User Fees: A Design Guide, GAO-08-386SP(Washington, D.C.: May 29, 2008).